A woman got more than she bargained for when she purchased a new handbag recently and found a potato scone inside. Claire Stewart, from Kilmarnock, Scotland, had purchased the new bag from New Look in Glasgow. 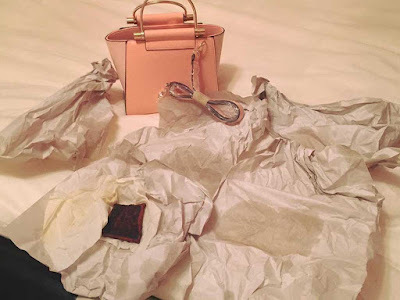 Claire, who had bought the pink bag to go with a wedding outfit, said on Facebook: "So I have a wedding today which I got a lovely bag (and outfit) from New Look in Buchanan Street Glasgow last Tuesday. "This morning I go to put all my things for the wedding in my bag, so I take all the paper out of the bag it's stuffed with to uncover a rock hard tattie scone! The paper is all greasy that was in the bag and the bag stinks of tattie scone?! 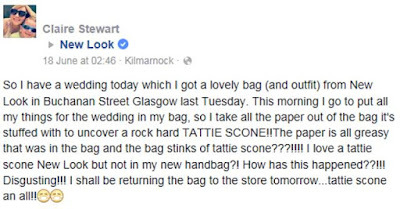 I love a tattie scone New Look but not in my new handbag?! "How has this happened?! Disgusting! I shall be returning the bag to the store tomorrow...tattie scone an all!" A spokesperson for New Look offered an apology for the errant breakfast favourite, telling Claire they were 'terribly shocked and concerned'. The company have vowed to investigate the matter. I'd never heard of a tatty scone, however a bit of googling looks like it's the same as a potato farl, a staple in any Ulster fry.